McDonald's took a major step toward protecting our life-saving antibiotics. On Dec. 11, McDonald's released a new policy to monitor the use of medically important antibiotics in its beef supply chain and set reduction targets by 2020. In 2015, McDonald's made the commitment to get the routine use of medically important antibiotics out of its chicken. Since January 2018, [site:name] Education Fund and its partners have called on McDonald's to do the same with its beef and pork supply. 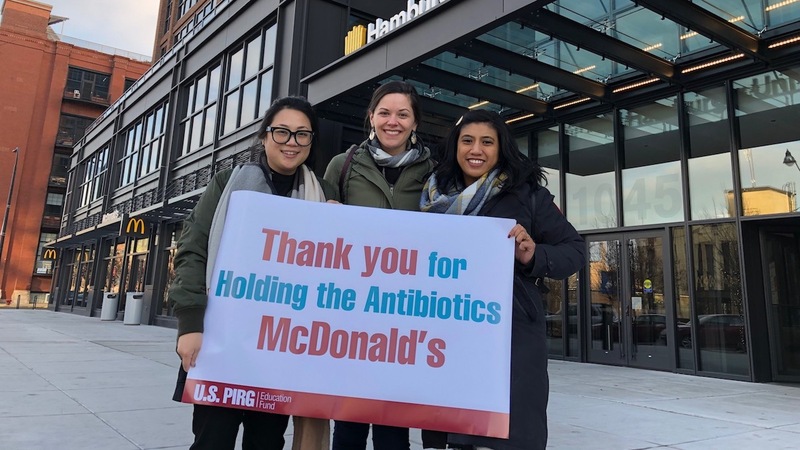 Its response shows progress, and we're working to ensure the burger giant continues to take concrete steps forward to restrict antibiotics use. Read U.S. PIRG Education Fund's press release here. Photo caption: Our staff applaud McDonald's decision to reduce the use of antibiotics in its beef supply chain.